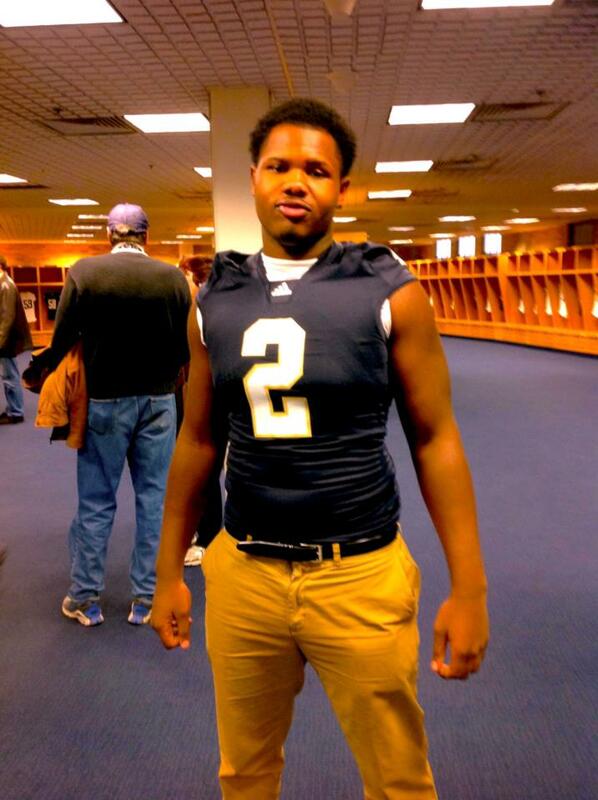 Jay Hayes looking stacked in his future ND uniform! G&BB had the privilege to sit down this evening with a future Notre Dame star. With his comical stance on life and his everlasting dreams, we’re extremely excited to introduce you to 4-star DT, Jay Hayes. Though the interview looks long, it’s an easy read thanks to his positive outlook and classy responses. Enjoy, ND Nation! Jake: What can Notre Dame Nation expect out of you as a player and as a man? Jay: Notre Dame can definitely expect a player who will reach his maximum potential, if not exceed it. I will also promote and advertise great character on and off the field as a student-athlete for the university. My play and sense of style will have fans excited and grateful to be apart of this program. Jake: People are already calling you the next Big Lou. Between your April Fools joke on Instagram and your rising popularity within the fanbase, how does the comparison with someone like Nix make you feel? Jay: It can definitely create huge expectations! However, I’m willing to surpass his comical personality (I THINK I’M FUNNIER)! And, as far as play, it definitely has me striving to allow my performance on the field to leave a large mark on the history of Notre Dame Football like he has. Jake: That’s great! If you could convince Nix to stay one more season after this, the media would go nuts with you two together, I’m sure! Jay: They definitely will. But, by hearing his story, I believe he will pursue the NFL. But trust me, I DEFINITELY WANT TO PLAY WITH LOU. Irish Chocolate 2.0 (points to myself). Jake: I love it! I think we could definitely get that going once you step foot onto campus. Jay: Yessir! I just have to make a huge impact on the field, which I will do! If I continue to work as hard as my body will let me, we could get t-shirts printed. That’d be sick! Jake: You prove it on the field, we’ll make it work…that’s G&BB’s promise to you! Jay: That’s the goal! LET’S WIN!! Jay: Yeah, I feel as if we all need to be contributing to the recruiting of other student-athletes. I feel as if it would mean more to a player if a group as a whole approached and contacted that recruit and told him that it would be a pleasure to get the chance to play with him. So, we all basically need to be on the same level of communication of getting the essential, must-get recruits. Jake: Last class, Jaylon Smith committed early, and went on a recruiting rampage. A lot of people claim he was a main reason the 2013 class was so tight-knit and elite. Are you willing to fill that role for this class? Jay: Yeah, that is definitely great for Jaylon, and I’m glad he has held a class together. But yeah, I can definitely contribute to recruiting and bringing a class together. When it comes to elite and top prospect guys, though, we as a group will have to illustrate our genuine interest in that player. Jake: Exactly! The thing that separates ND from the rest is our strict policies and high academic standards. We don’t recruit just anyone. With that being said, what was the best and worst part of the whole recruiting process? Jay: Yeah, ND has loosened up these past two years on letting certain student-athletes enter the school. Prior to that, if you really didn’t have good grades or SATs, you wouldn’t even be considered. Which, I think, explains the past couple decades. The best part of the whole process, though, would probably be getting to know some of the fans…knowing that they truly care about me as an individual. Jake: We definitely have one of the most passionate fanbases, that’s for sure. Jay: The worst part would be the useless waste of paper, in reference to all the mail being sent to my house and school on a daily basis. Hahaha! Jake: Ha! Aren’t you glad that new rule about unlimited texting to the recruits was overturned? That would be INSANE for a 17 year old kid to deal with! Jay: Oh yeah. I mean, it definitely can get overwhelming for one. But certain recruits act as if they’re already Hollywood. The recruiting process can lure a 17 year old kid into thinking he’s 26. Jake: Oh, absolutely. And that’s where the trouble (and violations) begins, too. So, you attend a high school close to where Ishaq Williams did. How has Ishaq’s decision to attend Notre Dame influenced you? Jay: I’ve always heard of Ishaq around NYC. But unfortunately and surprisingly, there was never a personal relationship between us. One obviously should not disregard the fact that I admired his decision once I heard he’d be attending ND, though. The rarity of a Brooklyn kid from the inner city who has an opportunity to attend Notre Dame gets no bigger. Jake: Once in a lifetime, man…you’re going to make a lot of people proud! Jay: Man, exactly. It can’t be rephrased any better! Wait, yes it can. 41 year decision…hahahaha! Jake: We’ll just say “lifetime decision” and call it good, ha! Has there ever been a time in your life where you had to overcome a major obstacle? Jay: Yes, the act of quitting my little league football team. Like, I just wasn’t the same after that, knowing that I’d become a quitter. It was someone I had to live with and it literally killed me inside. Jay: Well, now I look back at that moment when times get hard and say to myself, “I can’t let myself down, and more importantly, the team.” I find it crazy how little moments in life that people look past can actually have a bigger meaning and serve as motivation to a much larger struggle that one may endure now or in the near future. Jake: The good thing about Notre Dame’s coaching staff is how much they instill camaraderie into the players. There’s such a huge support system there, and with the lesson you learned from that little league experience, the future is extremely bright for you there! Jay: I really appreciate it, man. I’m taking things step by step. Jake: A couple more questions. Thanks so far. You’ve had some great responses! Jay: Anytime. I’m not one of those dudes who are like, “Yeah, things are great.” “Yeah, I like football, ‘cause it’s cool.” “Yeah, I like the process.” Talk about boo to the bland! Jake: Haha, which is why ND recruits guys like you who are well-spoken! So, most recruiting sites have you at 6’5” 270lbs…sound about right? Jake: Run me through a typical day for you…school, workout, practice, diet, etc. Jay: Ok. I’ll start off a day by waking up and eating a bowl of………….IRISH CHOCOLATE 2.0 CRUNCH (FYI, that’s a new cereal that came out)! Stretching in the morning is a must. Then, I head on the bus towards my school. I go through an extreme workload from classes. Then, I’ll eat lunch which usually I stack up on egg whites and a salad with a ton of turkey and watered down with some cranberry juice. Then after school, you will catch me in the weight room competing amongst my peers. After that are team meetings, and then off to practice. I take the bus home, get to my homework done, and Facebook chat with Jake. Hahahaha! Jake: Whoa whoa whoa. I don’t think I’m quite ready for this sort of daily commitment, dude. I’m a married man! Jay: Hahahaha. Sorry! Also, my Spanish teacher is a headache. SMH! Jake: Ah, no te gusta? Jay: Si! I swear he is bipolar! Jay: Hahahahaha, hey, a man’s gotta do what a man’s gotta do! Jake: That’s right! Alright, what sort of legacy do you and your teammates want to leave behind at Notre Dame? Jay: I don’t want to generalize for the whole class, but who cares, haha. Jake: Well, I’m sure y’all have some similar thoughts in common…like, you know…a couple championship rings? Jay: Well, I feel as if we all want to succeed at ND on and off the field, and leave a bigger legacy than previous classes. And we definitely desire a few BCS titles under our belt! Jake: Beautiful! Any last words for ND Nation? Jay: #GoIrish! IRISH CHOCLATE 2.0. Wait…nevermind, scratch that! How about IRISH CINNAMON? ND Nation, help me decide! Jake: I like that. Start your OWN legacy! Once you get on the field, we’ll get that going. Jay: Just have to keep working hard. Thanks again for the interview!